A guy walks into a museum…. 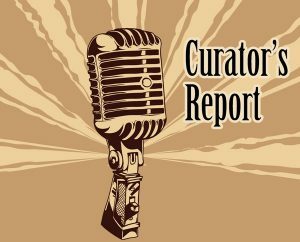 Miles City: A guy walks into a museum…. This is the 80-pound ball of gumbo removed from a calf’s hoof in Ingomar. But it also looks something like a giant prehistoric doughnut, perhaps one made several thousand years ago by the mother of a cyclops. MILES CITY — Here’s why I love the Range Riders Museum. I stopped in at the Miles City landmark on Friday, hoping to get a photograph of what I have long thought of as the most emblematic artifact on display anywhere in Montana. I hadn’t been there in years, but there it was, in a display case not far from the main entrance to the extensive museum — an 80-pound clump of gumbo that was pulled off a calf’s hoof near Ingomar. Gary Miller, co-curator of the museum with his wife, Bunny, said nothing else was known about the ball of gumbo. It was not known who the donor was, when it was given to the museum or exactly what feelings of pleasure were experienced by the calf when the gumbo was pulled from its hoof. I told Miller I might write something about the ball of gumbo, though I wasn’t sure quite what. Mostly, I said, I just loved how weird it was, possibly the only giant chunk of gumbo on display at any museum in the world. In fact, though the museum’s many buildings are stuffed with really fine, fascinating items — just check it out — I always think of the odd little pieces tucked away here and there throughout the complex. 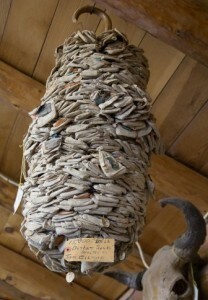 Tom Gilmore’s collection of 15,000 empty Bull Durham sacks, graciously donated to the Range Riders Museum. When I said something to that effect to Miller, he just smiled, pointed up toward the ceiling and asked if I knew what it was that was hanging from a rafter. I was still processing what my eyes were taking in — it looked something like a giant hornet’s nest — when Miller spilled the beans. It was a collection of 15,000 empty Bull Durham sacks donated by Tom Gilmore, “an old cowboy, a bachelor,” he said. “And he died of natural causes at 80-plus years old,” Miller added. Sure enough, in the Pioneer Memorial Hall at the museum, there was a photo of Gilmore seated on a horse, and it said he lived from 1893 to 1973. Another portrait showed a handsome and apparently hale Gilmore. And who knows whether Gilmore donated only a portion of the Bull Durham sacks he emptied in his lifetime. In any case, he smoked a lot of those very harsh cigarettes. I used to roll my own and I smoked Bull Durham for a while. You could get 15 to 20 cigarettes out of one muslin sack, so that collection of bags represents anywhere from 225,000 to 300,000 cigarettes. I was still taking that in when Miller said there was something else I might find interesting. What’s that? I asked. 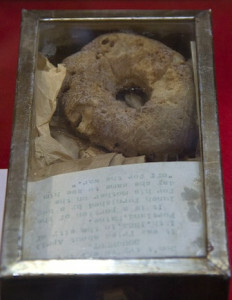 Ed Kemmick / Last Best News The famous 150-year-old doughnut. 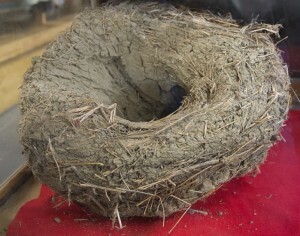 “Well, last week we had a birthday party for a 150-year-old doughnut we have here,” he said. He wasn’t kidding. Supposedly, a young man named W.B. Chick left Portland, Maine, on April 13, 1864, to fight with the Union Army in the Civil War. His mother made him some doughnuts on the day he departed, and 15 years after the war he came out to Miles City to serve at Fort Keogh. When Chick arrived, Miller said, “he was cleaning out his backpack and he found that doughnut,” apparently the only one left of those made for him by his mother. Chick gave the doughnut to his sister and it passed through several other hands before Mrs. H.K. Kroudy donated it to the Range Riders Museum when it opened in 1942. On April 13, the museum hosted the doughnut’s 150th birthday party, which was attended by descendants of W.B. Chick from all over the country. Also on hand were two men in Civil War uniforms detailed to guard the doughnut. It must be said that the doughnut doesn’t look anywhere near 150 years old. You’d almost swear it was still edible, though you’d probably want to dunk it in coffee first. Ed Kemmick has been a newspaper reporter, editor and columnist since 1980. Except for four years in his home state of Minnesota, he has spent his entire journalism career in Montana, working in Missoula, Anaconda, Butte and Billings. “The Big Sky, By and By,” a collection of some of his newspaper stories and columns, plus a few essays and one short story, was published in 2011. 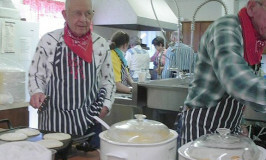 You can host your wake, party, reception or fundraiser at the Range Riders Museum. You do not have to be a member. Contact Us for more information.